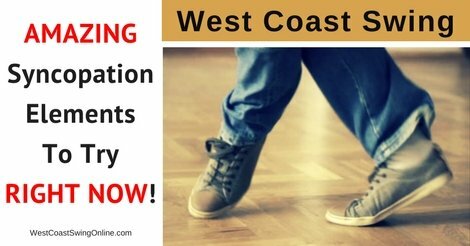 Just like most moves in west coast swing can be broken down into two-beat increments, most footwork syncopations can be broken down into smaller pieces. According to Robert Royston, by practicing the elements that make up the vast majority of footwork syncopations, it becomes much easier to synthesize them on-the-fly into more advanced combinations. Put on a song, and practice performing each of the elements of footwork syncopations one at a time. Remember to practice starting on both feet! Walks: Simply step on each beat on music. Slow Walks: Step on the downbeat and hold the upbeat. Touch Step: On the downbeat, touch but do not transfer weight into your free foot. You can touch at any angle that is comfortable for you; generally, you should stay within the arc that goes from straight forward to back at a 45° angle. On the upbeat, transfer your weight to that foot. Step Touch: On the downbeat, step to your new foot. On the upbeat, touch the ground with the free foot but do not transfer weight. Kick Ball Change: Keep your weight over your supporting foot. With your free foot, kick on the downbeat. On the & beat, put your weight on that foot but keep the foot under yourself, then step back to the original supporting foot on the upbeat. During this entire syncopation, your weight should remain over one side of your body rather than shifting from side to side. Point Ball Change: Same as the kick ball change, but with a point into the ground instead of a kick. Hold Ball Change: Same as the kick ball change, but the free foot does nothing on the downbeat. A popular version of this move is to straighten the free knee or both knees to a “pop” before performing the ball change. You will notice that some of the syncopations alternate the free foot, while others end in the same position that they began. The double rhythm variations (walks and ball change steps) should end on the same foot as you started. Conversely, the single rhythm variations (slow walks, touch step, and step touch) will end on the opposite foot. Once you are comfortable with the rhythms of the syncopations, you can begin to stylize them by changing directions or modifying the free foot. For instance, a step touch can become a step ronde. A touch step can become a smearing of the foot across the floor before stepping. Walks can add foot swivels, touches, points, and kicks can go in different directions, etc. Play with these styling options to find something that’s comfortable and looks good on you! This is a great video we did with 3 great ways to improve your styling with any partner you dance with. I think you’ll find it pretty interesting. Happy dancing!